A relatively inexperienced crew of two astronauts and a cosmonaut blasted off Wednesday from the Baikonur cosmodrome in Kazakhstan for a five-month mission on the International Space Station. 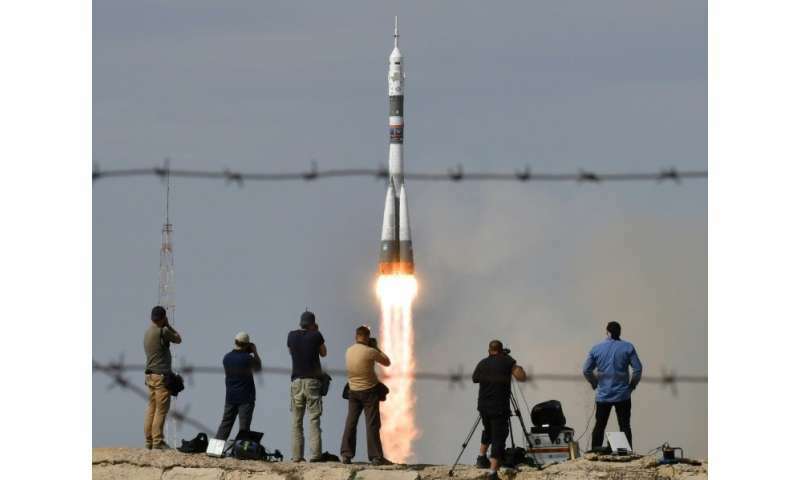 German Alexander Gerst of the European Space Agency, NASA's Serena Aunon-Chancellor and Russian Sergei Prokopyev of Roscosmos shot into the sky in warm, dry conditions at 1112 GMT. They should dock at the space station on Friday. The trio only have a total of one previous space mission between them—42-year-old Gerst's debut mission aboard the ISS was in 2014—making this one of the less experienced space station crews in recent times. Prokopyev, 43, will serve as the crew's flight commander for the two-day journey to the orbital lab despite having never flown into space before. Aunon-Chancellor, 42, who followed her father into engineering before training to be an astronaut and is also a practising doctor, was only confirmed by NASA for the mission at the beginning of the year. The rookie's late inclusion into the mission came at the expense of Jeanette Epps, who would have been the first African-American to serve on a long-term mission aboard the space station had she flown as expected. NASA did not explain the change. Gerst, who will be commanding the space station for the first time during his mission, referenced the steppe scenery in central Kazakhstan on Twitter Wednesday as he warmed up for the flight. "L-6 hours. On our way to the suit-up building. Got a great farewell from our friends and families. Crew is doing great. Looking at unimpressed camels on the side of the road. #horizons," he tweeted. According to ESA, Gerst will be only the second person from the agency to take command of the lab in the 17 years crews have occupied the station. Belgian Frank De Winne took charge of the station during a mission in 2009. Football fever has gripped the ISS in the build-up to the World Cup in Russia beginning next week and the Soyuz rocket that propelled the trio into space was emblazoned with the tournament's promotional emblem. Moreover, Prokopyev said at the pre-launch press-conference that the ISS crew would stage their own football match on the day of the final on July 15. "The composition of the teams will be international," Prokopyev said Tuesday. Russian cosmonaut Anton Shkaplerov returned to Earth on Sunday with an official football that he kicked around on the ISS and which may be used during a match, Russian news agencies have reported. The space laboratory has been orbiting Earth at about 28,000 kilometres per hour (17,000 miles per hour) since 1998. Space research has been one of the few areas of international cooperation between Russia and the West that has not been wrecked by the Ukraine crisis. ......as an expression of stoic independence?